(TibetanReview.net, Jan11, 2017) – Although urgently ordered back from India and Nepal with warnings of dire consequences for any failure to comply or otherwise banned from travelling to these two countries, Tibetans in their Chinese ruled homeland have been marking the Dalai Lama’s conferment of the Kalachakra empowerment at Buddhism’s holiest site of Bodh Gaya over Jan 2-14 in various ways, including through the internet. Residents of at least one Tibetan-populated county in Sichuan have been gathering in small groups to pray and to listen to the Dalai Lama’s teachings on the internet, reported the Tibetan Service of Radio Free Asia (Washington) Jan 9. Besides, “Tibetans living near Gyarong Trochu Thukje Chenpo, a sacred place in Barkham [in Chinese, Ma’erkang], have been participating in large-scale meritorious activities, including saving animals’ lives, during the period of the Kalachakra teachings,” the report quoted a local source as saying, speaking on condition of anonymity. People were also reported to have shared videos of the Dalai Lama’s teachings over social media, translating them from the Central Tibetan dialect, in which the exiled spiritual leader of Tibet gave his teachings, into the local dialect so that listeners had no problem understanding them. Also, “several hundred elders have … gathered to recite mantras and say other prayers,” the source was quoted as saying. The report cited other Tibetan sources as saying activities supporting the Dalai Lama’s ongoing Kalachakra teachings were also underway in Tibetan-populated counties in neighboring Qinghai Province, with residents defying official warnings by fasting, praying privately in their homes, and freeing animals destined for slaughter as a religiously meritorious deed. 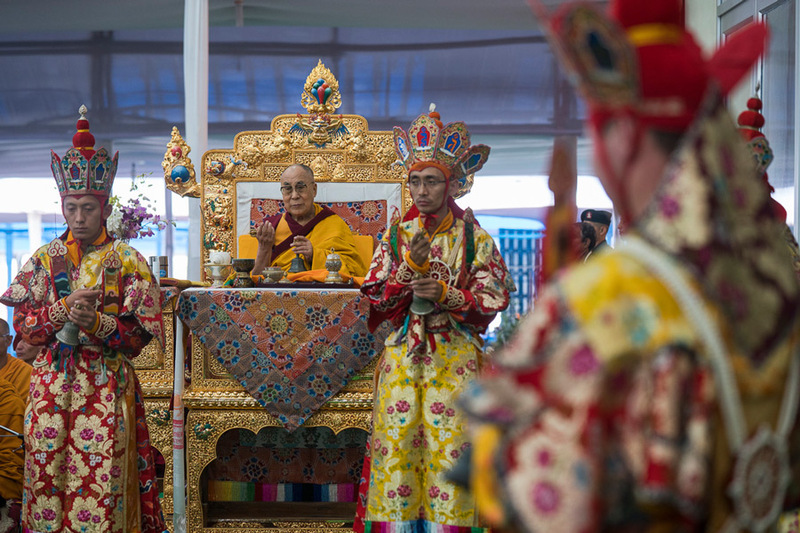 Local Chinese authorities had declared that the holding of the Dalai Lama’s Kalachakra teachings were “illegal” and threatened to severely punish any Tibetan spreading news of the event or organizing local ceremonies in support of the event. For example, Chinese authorities in the Tibetan county of Dechen (Chinese: Deqin) in Yunnan Province had issued an official circular, threatening jail terms of 10 days to five years for any Tibetan attending or otherwise expressing support in any manner for the mega religious event in India. Likewise, Chinese officials and police had on Jan 3 visited Tibetan monasteries in Gansu province’s Machu (Maqu) County and warned their management committees against any involvement in related events, the report cited a separate source as saying. They also warned the monastery managers to monitor the behaviour of the monks, vowing to hold them responsible for any breach of proper conduct. Tibetans in Tibet Autonomous Region have already been under an effective ban from travelling abroad, including with the confiscation of their passports since a couple of years or so back. And in the beginning of Nov 2016, the passports of Tibetans living in other Tibetan territories were confiscated while those who were already travelling in India and Nepal were ordered back home before the Kalachakra teachings commenced.